Aww... Megumi always sends you the cutest things!! How fun!! I love those markers! I picked up a FriXion gel pen at the fabric store. It's great to mark fabric and then steam iron off the markings. Cute but if the marks from the markers go away with heat, then will they disappear in the Summer or if you left it in your car like those new receipts? I work in a junior high school in Japan, and my kids are obsessed with those pens! Every girl in the school (and lots of boys) have the full set of 24! They also have versions which smell nice! My erasable red pen, (which is great for marking tests!) smells like strawberry! What a great goodie bag! So jealous. I love my FriXion pen but I hate that it is a gel pen, I would love a felt, which would give me a steadier line on my fabric. So fun! These goodies are darn adorable! You lucky girl! You pretty much won the lotto in my eyes. This is why I need to head to Japan. Or maybe not 'cause I'd surely come home broke. Don't you just love those translated tag lines on Japanese products. They're always good for a laugh. Enjoy your goodies! Oh goodness I miss Japan and all their amazing adorable gadgets! I want to be Megumi's friend, too! It's all adorable. Ok, where do I find one of the hedgehogs? Panda8ngel, I don't know the answer to that, either. I've only had these pens in winter so far. L-O-V-E those eraser pens. Way, way cool! all so great! especially the decorative tapes & the cute hedgehog! enjoy them! Wow! So many people have seen even those wrapping paper!? "Hi! I'm Megumi!" to How About Orange fans! It's always hard, but fun to keep my eyes open to find things which will satisfy my friend! Hope you enjoy them all! Quirky? I've heard of that word, and looked it up in the dictionary. Hmm. Probably true. Wow you are so lucky! :) I just got a letter from my penpal in Korea and I can't wait to show it on my blog. The FriXion ink is thermo-sensitive, so it will vanish in high temperatures (like in a notebook left in a car during the summer), but returns when placed in cold temperatures, such as in a freezer. These are really fun pens! Please tell me where to get the MoPet Hedgie. He's so squee I can't even take it! 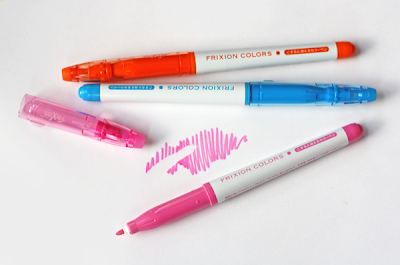 I want to run out and buy some of the FriXion pens right this moment! The only thing that kind of weirds me out is that the ink is still there, though invisible, after heat is applied. In my head, I see myself marking fabric, making a dress, and then wearing it on a cold day. Imagination me looks down with a gasp to see that there are little squiggly lines all over my dress from the FriXion. Now, I know this won't happen because I'm not going to draw all over my dress fabric, but the "haunted" recipe cards seem like a real possibility! I nearly wet my pants when I read the line 'It is living in your life'! The last time I went back to Japan, I found a trade sign of a cafe saying 'Cofee & Japan'. So... they sell 'cofee' and Japan...??? Anyways, I'm having a 'Goodies from Japan' Giveaway (stuff I brought back from Japan) on my blog; please come and have a look! One of my friends was encouraging me yesterday to check out "the big blogs" instead of just reading my friends', so I basically opened everything that was nominated for a Bloggie this morning, and . . . you're basically the only one I like. So hello! I've already Pinterested (is that a word?) about half your blog. Aw, thanks! And I vote that Pinterested should be a word. That tape is SO CUTE!! What a fun mix of items! I will be checking out those erasable markers. I'm always a sucker for new writing utensils. Wow -- that erasable pen -- it's like having Photoshop on paper! I want to deposit pigs on paper! Hey, what's the name of the store that's written on those gift bags, or Megumi (if you're reading) where did you shop? I'm going to Japan at the end of March and I must get those Deco Rush tapes!!! This is my first visit to your blog and I must say I love it. I'm not much of a commenter but I felt compelled to tell you just how much I love your style. Thanks so much. I wonder if they might have things like the decorative tape there. I'll have to check next time I visit. the decorate pen tape is so cute! Well, the wrapping paper is not really special. The green one is from Ito Yokado, but I didn't ask for a special bag. Just they put the tapes and pens in it. 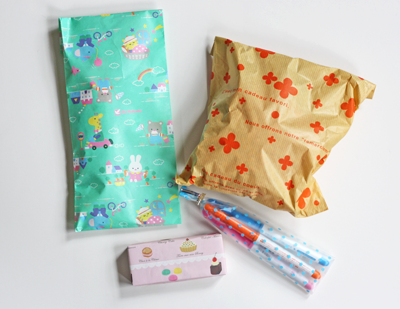 The rest, the brown paper one, the plastic bag, and the pink wrapping paper were from 100 yen shop in Japan. Either DAISO or Seria. Those 2 shops are very popular here. Kinokuniya must have Deco Rush, I guess. 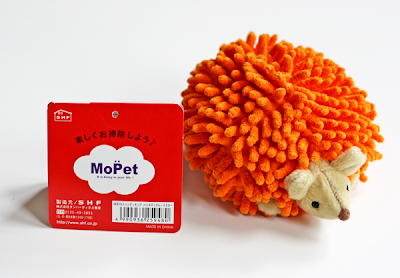 You can check Amazon.co.jp as well. Oh my god. I need all of these stuff! I love Japanese goodies. I'm jelly. Always very cool, these things you show us. 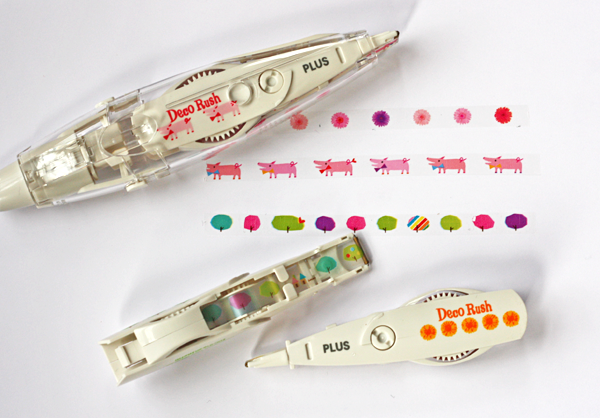 While we are all going to order those gel pens immediately, of course we are all dying over those little Deco Rush tapes. I hope you'll let us know if they land on an English-language online shop--your post probably did them a huge favor! I have the nice Japanese marker pens and they're really nice, though a few are already drying out. I saw a video about them (sorry, can't find it) where someone made a lovely drawing, then put the paper over a steaming kettle, and the ink all disappeared. They then put the paper in the freezer and the ink returns. Is there anywhere in the US to get those decorative tape pens? I don't know of anywhere. not sure they have the decorative tape pens but i do know they carry cure japanese masking tape. Sugoku kawai! you have a great friend! Thanks for the great advice! I found the Deco Rush tapes at Maido (http://www.mymaido.com/content/4-about-maido) in San Francisco. I bet if you called them, you could have them ship them. i love the decorating tapes !! A note on the Deco Rush tapes: Elizabeth visited Maido in San Francisco and confirmed they will do mail orders if you need some tape! See her blog post here.